In 2002, I met Erika Dreifus because we were studying in the same MFA program. From the time I met her, I was impressed by her intelligence and talent. We've kept in touch in the years since finishing our degrees and I am so pleased for her that her first collection of short stories has just been published. I've read and enjoyed her work and I recommend it to you. Erika has graciously agreed to write a guest post for Brave New Words. Congratulations on your collection, Erika! 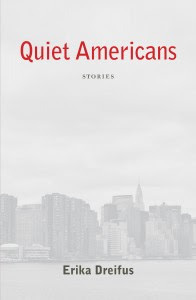 One challenge that some English-language fiction writers face--I, for one, have encountered it numerous times while working on the short stories in my collection, Quiet Americans--is how to manage the use of non-English ("foreign") words in one's work. Although it's not my ideal, one possibility is to append footnotes or a glossary. I was willing to add such information when one anthology editor asked me to do so for the story I had contributed. Perhaps I was persuaded, in part, because this editor seemed semi-apologetic about his request and emphasized the educational nature of his book's project. But when the same story has appeared elsewhere--including in the new collection--I have omitted the glossary. 1) Characters can be translators and interpreters. In an important section of my (unpublished) novel, an interpreter listens to one character speak in French. The actual French words are, for the most part, suppressed. But the speaker's body language, facial expressions, and other details give some idea of the content. The interpreter then summarizes what has been said in English for the benefit of an American-born character who does not understand French (and, oh-so-cleverly, for the reader). Your guide--an unusually petite woman named Greta who is wearing a string of green beads and whose lined face suggests she might be in her fifties, like your parents--lets forth a stream of words in German and then she says, in English, that this is how she runs things: she will tell the group everything in German and then repeat it for the English-speakers. You smile. You've already forgotten nearly all the German you learned that summer you needed to acquire proficiency for graduate school. Except for one word. And it's not a day of the week or a month of the year or a color or anything so simple. It's Vergangenheitsbewältigung. It's a word that means, roughly, "coming to term with the past." 3) Trust the reader. Whether it's a single word or a longer phrase, some readers will understand what you've written. Others may actually take the time to look up something they do not understand. This is the choice I made with the title of my short story, "Lebensraum." Although I hope that readers will be familiar enough with 20th-century European history to recall the term, I realize that it's unreasonable to expect all readers to know it. Still, it's easy enough to find an adequate definition. Managing "foreign words" in fiction remains, for me, a fascinating topic. I'm curious: As a reader, have you noticed other techniques practiced? If you're a writer, how have you negotiated this challenge? As a translator, how do you decide when a given word simply must remain in its original (if italicized) form, rather than in the target language? Please share your thoughts in comments here. Thank you in advance. Erika Dreifus lives and writes in New York City. She is the author of Quiet Americans: Stories, which was recently released by Last Light Studio Books. Please learn more about Erika, her book, her blogs, and her newsletter for writers at www.erikadreifus.com. Very helpful, Erika. You confirm what I've been thinking about the Yiddish and Hebrew terms included in my current project. Here's to your new book! Thank you, Sarah, and good luck w/your current project! Subbed vs. Dubbed: Where do you stand?